Industrial Solid State Relays | Gordo Sales, Inc.
For decades, electromechanical relays (EMRs) have been the go-to choice for heavy-duty power switching. While these systems have their merits, there are specific applications where solid state relays (SSRs) are the better option. They are exceptionally reliable at switching a wide range of loads, including heaters, compressors, fans, motors and others. SSRs allow for high-speed, high-frequency switching operations. Because they have no movable contacts, they produce no contact failure and generate little noise. Since SSRs don’t have moving parts, the only limitation to their life expectancy is whether they are used within their specifications or how well the heat dissipation is managed to minimize thermal gradients. With SSRs, you won’t encounter sparking between contacts and problems with contact corrosion. Unlike their electromechanical counterparts, SSRs don’t produce arcing and switch bounces, resulting in enhanced electrical performance and a much longer life expectancy. Much like EMRs, SSRs are also capable of withstanding extreme temperatures and dirty environments. They are resistant to vibration and shock. 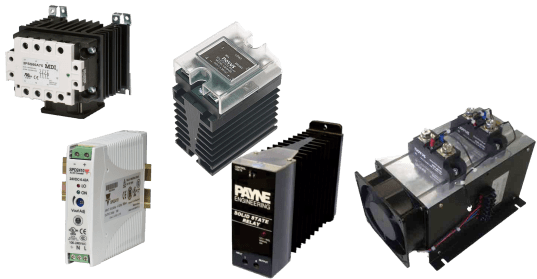 Shop Solid State Relays at Gordo Sales, Inc. Solid state relays deliver the high precision power modulation and smooth power output to the load that ensures your process stability. Typically used to replace mechanical contractors or mercury relays, solid state relays provide reliable and cost- effective power control.